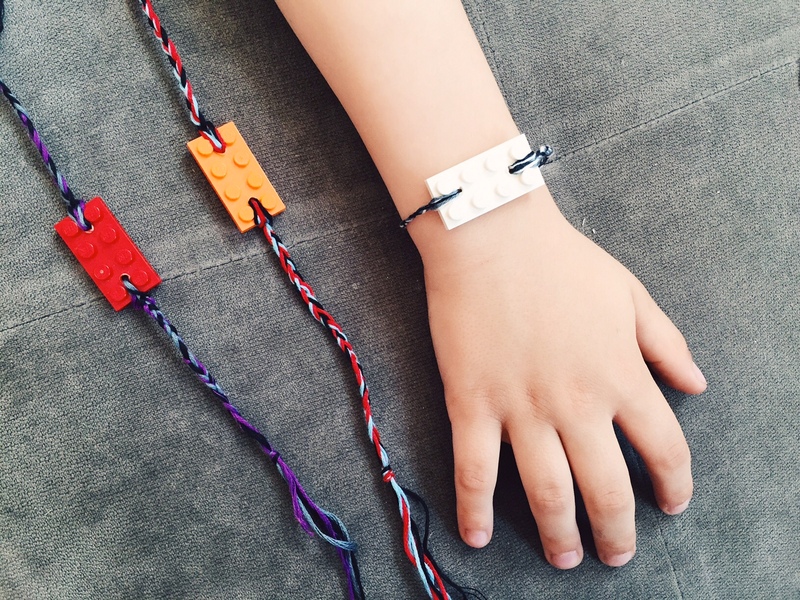 The perfect craft for your lego-obsessed kiddo! Actually mine loves making bracelets too so this really was the perfect craft. We had everything laying around at home, even the correct drill bit! Using a drill and the 3/32″ drill bit, drill 2 holes in each LEGO brick; We found it was easier to do it from the back and through the round hole because when we did it through the front the lego broke. Cut embroidery thread in a few different colors to one length. Put all of the colors together and fold them in half. Thread the loop through one of the holes.Pull the loose strands through the loop you have formed once pulling part of the thread through the hole. I used the a safety pin and the top of a needle to help push the thread through the hole because the hole was kind of small. Pull the thread tight. I had milo hold the lego while I braided the thread. Tie knots at the end and you are done! I found the original idea here. This mastermind of a recipe comes from the super genius Shutterbean! Its a super fun take on pizza and was absolutely delicious. I also have this thing with daiya cheese. I dont really like it on pizza, but when its IN something, it gets kinda creamy and delicious; and since you bake the cheese IN the dough, I’m all for it! I added some spinach, olives and tofurkey sausage to mine. I will definitely be adding these to the mix! Loved them! Line a baking sheet with parchment paper and grease the baking sheet with olive oil. On a floured surface, roll out pizza dough into a rectangular shape, roughly 9 x 16 inches and position so the short sides are parallel to you. 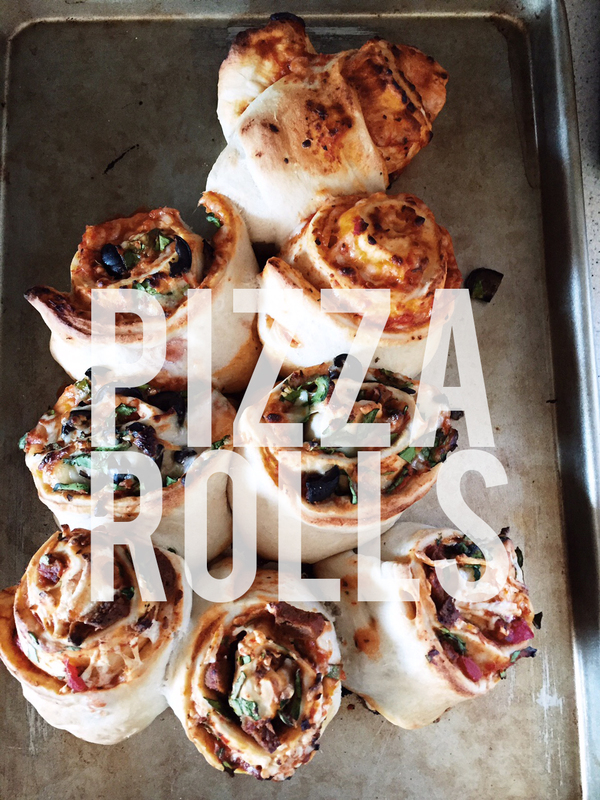 Spread the sauce evenly on the rolled out dough, leaving about a 1″ border around the dough. Place about 1 cup shredded cheese, followed by your veggies and some of the basil. Using your hands, lift up the bottom edge of the dough and roll it forward into a tight cylinder. Place dough cylinder, seam side down, on a cutting board and, using a thin, sharp knife, cut cylinder crosswise into 8 equal-size slices. Nestle the slices, cut sides up on a parchment lined baking sheet. Brush 1 tablespoon olive oil onto the edges of the dough and bake until golden brown about 15-20 minutes. In the last two minutes of baking, pull rolls out of the oven and top with more cheese if youd like. Place rolls back into oven and bake until cheese melts. Remove rolls from the oven, let rest for 5 minutes and sprinkle with chopped basil for serving. 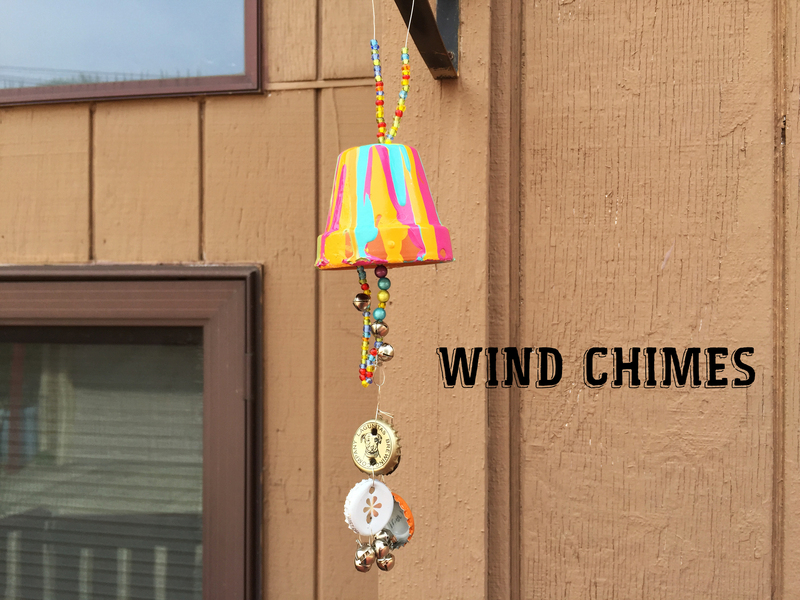 Milo and i worked on making these windchimes as mothers day gifts this year. He had alot of fun, especially the painting part. First we painted the pots. turn it upside down and put it on wax paper. Squirt the paint towards the top of the pot and let it drip down. its ok if the colors run together. Get creative! You can also add ribbons or other embellishments when dry. When it dried, i sprayed it with some spray enamel to kind of coat the paint, in case these are out in the rain. I didnt think the paint would come off, but wanted to be sure. Next i used a nail and a hammer to hammer a two holes in my bottle caps. I used jewlery wire to connect them, along with some bells and beads. I took a long piece of jewlery wire and put it down through the hole in the pot. I made sure there was a big button on each sides of the hole as well, which i later hot glued to help keep things in place – I added beads and bells and then looped it back through, adding more beads on the top. Seal up the top, and there you go! While in japan, I recently discovered gobo. I guess here in the states it is also called Burdock. I found some at my asian grocery store – its sort of like a turnip. Anyway, served up with some carrots and a light sauce its really delicous and really healthy – filled with fiber! 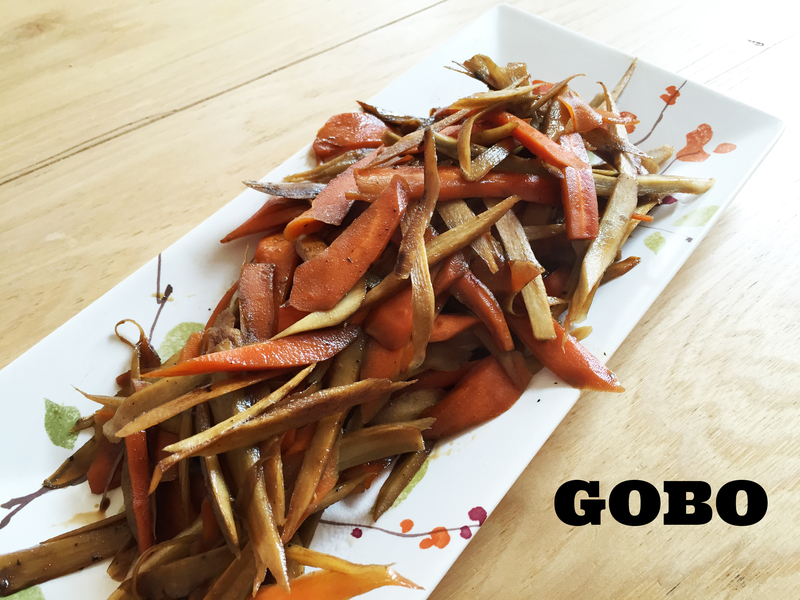 Peel and slice your carrots and gobo at a 90 degree angle. Prep a wok with a little bit of oil and add gobo and carrots to pot. Stir fry around for about 5 minutes, then add soy sauce, mirin and vegetarian dashi. Let cook for another 4-5 minutes, then add a little bit of water to the pan to get it to sizzle and cook up some of the sauce. Let cook for about 5 minutes more and serve. Hey! I made curry again! 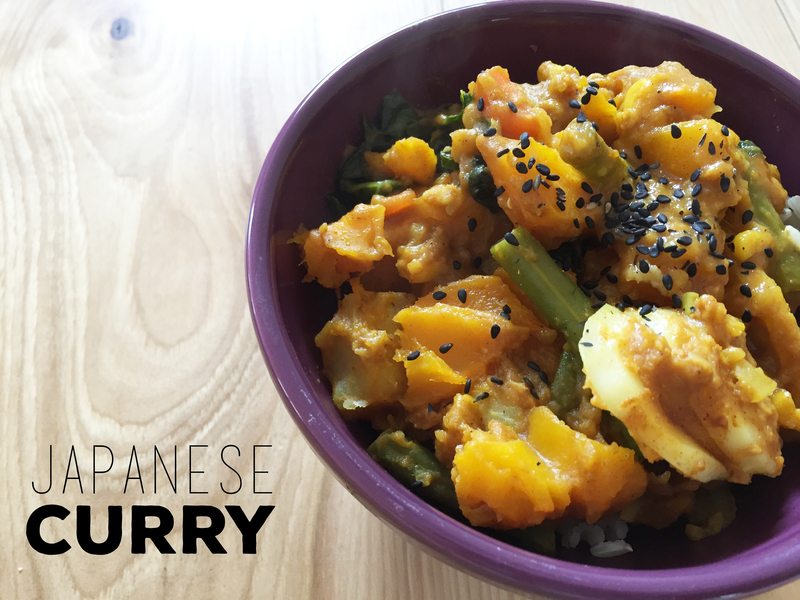 This time it was a japanese style curry, with kabocha squash. Prepare your squash and roast cubes at 425 for about 30-40 minutes or until tender. Heat oil over medium heat in a large soup pot or Dutch oven and add the onions. Cook, stirring often until onions are translucent, about 5-7 minutes. Add garlic and continue to cook for another minute, until fragrant. Add tomato paste and curry powder, cook for another minute, until mixed in. Add the broth, carrots and bring to a gentle boil, cover and reduce the heat to medium low and simmer for about 10 minutes. Carefully remove foam as it forms (optional). When there is no more foam, add grated apple and soy sauce. Cover immediately. Meanwhile, make the roux. In a small saucepan, heat the oil over low heat, add the flour all at once, whisking until incorporated. Brown roux, stirring constantly for about 10 minutes. Add the curry powder and continue to cook for 2 minutes until fully combined. Remove from heat immediately. Add a ladleful of liquid (up to 1 cup or more) from the vegetable pot into the roux and stir rapidly with a wire whisk until smooth. Add more if needed, then transfer the roux mixture to the vegetable pot. Stir constantly until the curry is smooth. Add the green beans and kabocha. Cook, stirring often, about 10 more minutes until it thickens a little. Just before serving, stir in the non dairy milk and season with salt. Serve over rice with sesame seeds.